What is the cause of Lyme Disease? Lyme disease is caused by Borrelia burgdorferi, a spirochete bacteria that is transmitted by ticks. In North America, the eastern and western black-legged ticks (​Ixodes scapularis, Ixodes pacificus) are the vectors of transmission. The tick transmits the B. burgdorferi while taking a blood meal. 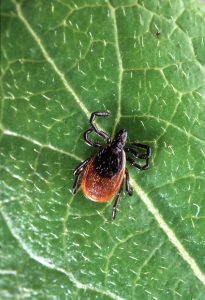 The transmission occurs sometime after 24 to 48 hours of tick feeding. Dogs exposed to Lyme Disease do not necessarily develop illness. If acute clinical signs develop it can take 2 to 5 months after infection before symptoms develop. Clinical signs could include fever, shifting leg lameness, swollen joints, malaise, enlarged lymph nodes, anorexia, and lethargy/ depression. Chronic signs could include polyarthritis and kidney disease/ failure. How can I found out if my dog has Lyme Disease? At Lawndale, we recommend annual testing with a 4DX heartworm/ tick-borne disease test that not only tests for heartworms, but also screens for 3 other tick-borne diseases including Lyme Disease. A positive Lyme result indicates the dog has been exposed to Lyme disease and has made antibodies to the B. burgdorferi. Since a positive test only confirms exposure, we will use our physical exam results and any clinical signs to decide if additional lab testing or treatment is warranted. What is the prevalence of Lyme Disease? Lyme disease has a higher prevalence in certain areas of the country. Formerly it was thought that the disease only had a high prevalence in areas such as the Northeast. However, as of April 20, 2015, according to the Companion Animal Parasite Council (CAPC) Lyme Prevalence data, North Carolina is now listed as a “High Infection Risk” area for Lyme Disease. In fact, just since the beginning of 2015, 88 out of 2742 dogs in Guilford County have tested positive for Lyme (that translates to 1 positive for every 31 dogs tested). How can I protect my dog from Lyme Disease? Implement yard control measures (keep grass mowed, clip shrubbery, etc.